This episode kind of struck me as being like a casserole of leftovers. You've got your brown rice from the other night, some pieces of steak from last Thursday, and maybe you whip up a batch of egg noodles to help stick the whole thing together. The end result is palatable, but just barely. It's a whole bunch of pieces of stuff that would have been better if they were fresher, and on their own. You mash it all together and it's just a mess. So, the other stuff. The not-so-good stuff. I cringed at Quagmire's mortification at being exposed as a bald guy so publicly, when I'm pretty sure I was supposed to laugh. And they dropped this plot for no apparent reason. I'm also not sure why Quagmire didn't just go back to wearing his dang toupee. There really was no need for him to be in the hospital in the first place, except that it was an excuse to kick off the next plot. 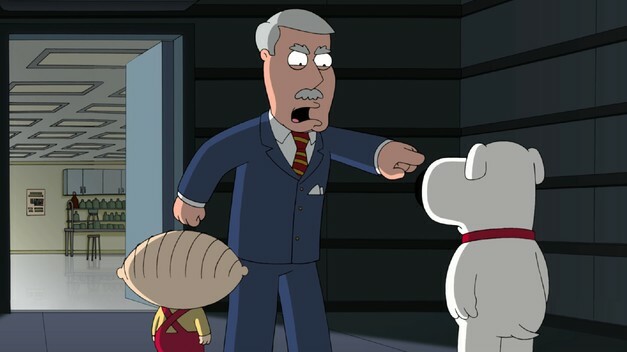 Brian and Stewie come up with a lot of theories as to Carter Pewterschmidt's suddenly healthy appearance, and every single one of them is better than the one that turns out to be true. What a half-hearted dig at the pharmaceutical companies. The truth is that if you had a cancer cure, you could charge three million dollars a dose, while still offering the standard treatments (chemotherapy and such) at the normal price. Why not monetize the cure, instead of letting it sit idle in a safe? The worst crime perpetrated by this episode was the slack pacing. It's easy to forgive some crappy plot points when the episode moves along, but this one seemingly had no velocity. It was a lifeless dud, which in many ways is worse than the preachy self-righteous episodes that they tossed out at us last season. Yikes.